I am completely inspired by my community. Not only because it is comprised of amazing individuals, who each bring their own unique flavor to the table. Nor solely based on the fact that they produce great ideas for living in the spirit of Mercy. It is mostly because they act upon these ideals of spirituality, simplicity, service, and community, that I am grateful to be part of such a group. There is no doubt that weekly spirituality nights strengthen our volunteer experience as a whole. The action-based sessions stand out to me. At the mid-way point for the year, we wrote letters to our end-of-the-year selves, expressing the best parts of the year so far and what we hope to accomplish by the end of our service. For the Christmas season, we made a wall tree comprised of post-it notes. Each piece of paper has something we are grateful for the day we wrote it. The most challenging assignment was writing notes of encouragement and passing them out on our work commutes. Most strangers were immune to paper distribution, thinking we were spreading an agenda, but it felt good when people ultimately accepted what we had to offer. Outside of spirituality night, we as a community have decided to give up meat during Lent. Not only is there hope to be spiritually strengthened by this, but we are using this as a prolonged act of simplicity. It was agreed upon that we take measures every day to live simply, including unplugging electronics and utilizing the standard reduce, reuse, and recycle method. However, we wanted to take it further with a weekly Simplicity challenge. Each spirituality night we draw a paper from our jar, which dictates what extra measure will be taken (or more often, what we will go without) for the duration of the week. Examples include: 4 days without Netflix, cutting shower times in half, no name brands, 4 days of candlelit dinner, and cutting AC use in half. Sometimes the challenge bleeds into the next category of serving our neighbors. Aside from collecting spare change and handing it out on our commute, our community does absolutely no other form of service. JUST KIDDING! I am amazed that on top of a 40-hour week of service, there is still the energy and drive to search out extra volunteer opportunities. So far, these include a park clean-up, a morning at a soup kitchen, and the co-teaching of ESL classes. One of our members noticed there were few altar servers at Mass and made an offer to our parish to do some youth outreach and coordination. While many of these efforts have been made on an individual basis, there is an intentional effort from all, with all, to strengthen the community. Have you heard the phrase, “The family that prays together, stays together”? Well, we believe eating can be a form of prayer, and when food is around, we are stuck like glue. Besides dining together at least two times a week, we bond by going to parks, watching movies from collective library runs, and challenging each other to work out. (Although I think all of us would like to hit the exercise machines more often than we do.) Museums are a common interest in the group, and we are all excited to take advantage of the new NYC municipal ID cards that will give us access to these and other cultural institutions. It is a pleasure to be a part of such an inclusive, exploratory community. 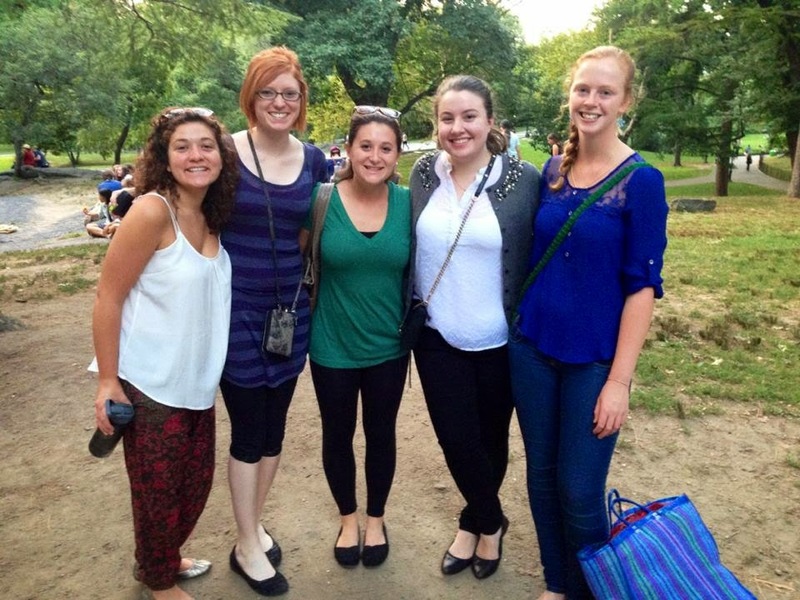 It is evident why the individuals of the NYC community were drawn to Mercy Volunteer Corps. Mercy’s tenets of spirituality, simplicity, service, and community are appealing to us as agents of positive growth. MVC and its mission has caused our group to challenge each other in our development, and that is something I believe will impact my lifestyle long after this year is over.